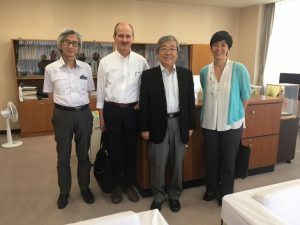 UF’s partnership with Rutgers University took another step forward during a recent visit to UF by Professor Paul Schalow, Chair of RU’s Asian languages and Cultures Department. He donated to UF a set of documents handwritten by William Griffis, who was invited to teach at Fukui during early Meiji and subsequently became the foremost Japanologist of the era. 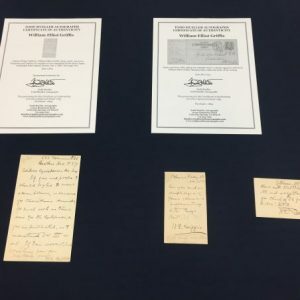 The documents, which record his correspondence with his publisher, will be welcome additions to the “Griffis Collection” at UF’s Central Library. 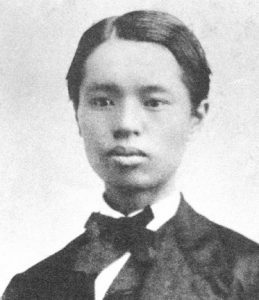 Fukui’s relationship with Rutgers goes back to Taro Kusakabe, the first Japanese Student to earn a University degree in the U.S., who became a legend having tragically died just before graduation in 1870. William Griffis was Kusakabe’s tutor in Latin at Rutgers. UF and Rutgers concluded an agreement for scholarly exchange in 1981. After a lapse this agreement was renewed in August 2016 with the newly established School of Global and Community Studies acting as UF’s focal point. This was followed by a visit to Rutgers by Dr. Mitsufumi Mayumi, President of UF, in April 2018, when he and Dr. Barbara Lee, Senior Vice President for Academic Affairs of Rutgers, signed an MOU for Student Exchange. The first UF student to study at Rutgers under this MOU will leave later this month for a one-year program.